theclosing was started in 2004 in Vienna as a project at the intersection of music and visual art, improvisation and sound design, experimentation and careful arrangements. 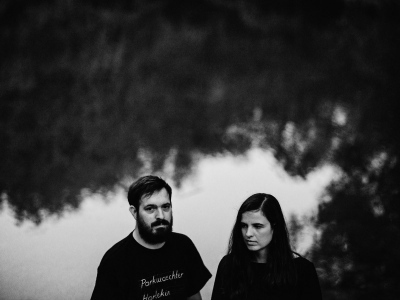 Having released an EP and two successive albums - 2012’s »theclosing« on Circle Into Square and Fake Four Inc. and 2017’s »dents« on FilthyBroke Recordings -, their third LP »MATTER« for the Berlin-based Anette Records is the first by Daniela Palma Caetano Auer and Alexander Hengl entirely as duo. Mixing analogue and digital sources, sheer noise and harmony, distant sounding snippets from everyday life and processed vocals, »MATTER« further refines theclosing’s experimental sound palette. Stylistically, theclosing draw on noise, drone, ambient and experimental recording techniques, but also show a knack for off-kilter hip hop beats and the occasional techno groove. It is a mixture the two can successfully translate to a live situation, as 2015’s »Live at Beatmaker Sessions« has already proven. theclosing have played multiple shows with noise rap pioneers Dälek, shared the stage with artists like Zavoloka, Gonjasufi, Buriers, Jel or Cavanaugh (Open Mike Eagle & Serengeti) and have presented their immersive, audio-visual live shows at experimental and underground festivals like Unsafe+Sounds (Austria) or Les Digitales (Switzerland). »MATTER«, theclosing’s third album and their first as a duo, sees Daniela Palma Caetano Auer and Alexander Hengl paint their own sonic world with a colourful palette of musical influences. Mixing analogue and digital sources, sheer noise and harmony, distant sounding snippets from everyday life and processed vocals, »MATTER« comprises material that is based on long-form improvisation. The Viennese producers draw heavily on textural ambient, post-rock dynamics and adventurous forms of electronic music on their debut for Berlin’s Anette Records to paint a holistic picture with musical means. »MATTER« is thus a record dedicated as much to catharsis as to genesis - to closure, but also to the ways that take you there. As an album, »MATTER« floats freely and radically changes course when you least expect it. Six minutes into the eerie yet ethereal ten-minute opener »CORRELATIONS«, an intricate beat emerges from the thick fog of densely layered field recordings, drones and fractured voices. Complemented by the blaring synthesizers and a driving bassline, it creates a groove where before there was only a haunting, impalpable atmosphere. It is a decisive moment on this record that is full of unforseen turns. From the fluttering beats of »ITERATIONS« to the murky noise of »ARRAY«, which suddenly erupts into outbursts of complex rhythm work, »MATTER« creates an ebb and flow of intensities. »AERIAL« opens the flipside as a slowly unfolding piece that harkens back to the heydays of the clicks’n’cuts style before picking up speed with a throbbing techno groove. The title track closes the album with a tense organ-like loop that provides the template for broken beat experimentation from which a steady groove arises after a while, marching forward towards something entirely different. It is the perfect closing statement to an album which explores the relationship between matter and energy, and which is both emotionally and spiritually charged but which, most of all, does not at one second compromise stylistically or otherwise.